Saturday 9th May 1987 is a date etched in the memory of Burnley fans as we beat Orient to retain our place in the Football League on the last day of the season. But for one soon to be Burnley player it was a day just as significant albeit in South Wales. Peter Daniel was player manager of Lincoln City and whilst Burnley won and Torquay drew, his side were beaten at Swansea City and became the first club to be automatically relegated from the Football League with Neil Warnock's Scarborough replacing them. For Lincoln it was just a year out before they returned as Conference champions but for boss Daniel it was back to purely playing and a transfer to the club that had just beaten that drop, Burnley. By then Daniel was 31 but his career had started in the late 1960s with his home town club Hull City when he joined them as an associate schoolboy. He was a mere 13 then but four years later had done enough to earn himself a first professional contract after successfully coming through his apprenticeship. He won a regular place in the first team in 1974 and played in both full back positions although favouring the right back slot. Such was his form that he made no fewer than seven appearances for England at Under-21 level and that form prompted Wolves to sign him for over £150,000 in the summer of 1978. By then he had been converted into a midfielder and was soon getting his first taste of top flight football in his new position. In that first season at Molineux he came close to a Wembley appearance in the FA Cup but they were beaten by Arsenal in the semi-final, the Gunners going on to beat Manchester United in the final. He was in the Wolves side that beat Burnley in the second round of the League Cup in the following season and this time they went all the way to Wembley, beating Nottingham Forest in the final. A broken leg meant he missed the 1981 FA Cup semi-final but he regained his place after regaining his fitness. Wolves were relegated in 1982 but a year later were back in the First Division although Daniel missed much of the season with injury. Wolves' stay was just one season after which they suffered three successive relegations but prior to that Daniel was on the move again, going to America to play for Minnesota Kicks in the summer before signing for Sunderland. He had just one season at Roker Park and it was a bitter sweet season. Again he played at Wembley in a League Cup Final but this time he was on the losing side against Norwich. Both of them were relegated at the end of the season and early in 1985/86 he was signed by Lincoln City. He was signed by former Blackburn boss John Pickering who was soon replaced by George Kerr. They were relegated to the fourth division in 1986 and when Kerr left in March 1987 they turned to Daniel to ensure they didn't drop close to the bottom of the league and face another relegation battle. That's exactly what they did and Daniel became the first manager ever to get a side relegated into the Conference. He immediately left Sincil Bank and was one of Brian Miller's summer signings. Injuries played a big part in his time at Turf Moor. He started initially in the midfield but reverted to right back and that's where he played when he made his third Wembley appearance. This time it was in the Sherpa Van Trophy Final against his former club Wolves. In the following 1988/89 season injuries again hit him and when the club signed Ian Measham he decided it was time to hang up his boots. That didn't end his involvement with the game. He signed for North Ferriby United where he eventually became manager from 1990 to 1993. Afterwards he managed Pontefract Collieries, Winterton Rangers and Denaby United before taking over at Goole Town in 2000. His time at Goole was short lived and he was sacked in 2001 and he returned to Pontefract but resigned at the end of 2003. That looked as though it might be the end but in November 2004 he started a second spell as manager of Winterton Rangers. It's been a successful spell, with two promotions, and it led to him coming under consideration for the Grimsby job last year prior to Mike Newell landing it. He missed out and continued at Winterton until the end of the 2008/09 season. After steering them to fifth in the NCEL Premier Division he resigned and was replaced by Richard Sennett. Peter Daniel will not long be remembered at Burnley and one of my memories of him was at a Supporters' Club Q&A evening when he told one supporter to stop asking stupid questions. 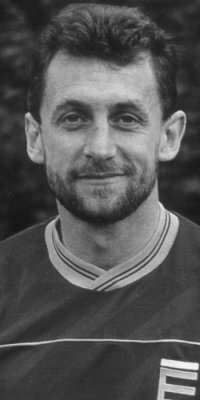 On the field there's no doubt that in his short time at Turf Moor he helped lift the gloom of the 1986/87 season and move the club in the right direction via that Wembley appearance. There's no doubt though that he was way past his best when we signed him, the first division player of some years earlier had been lost in time and with the injuries he'd sustained.